A weekend of firsts…£150 raised! A slightly random weekend, on Friday evening I came across an add on gumtree, that they needed staff for the Paulo Nutini gig in singleton park on Saturday. I got in touch not expecting them to have spots left the night before the gig, but at 10.30pm I got a text and email with a brief. Turn up smart all in black for 3pm, shift finished at 10pm. On arriving I saw a group of about 20 people all wearing black, sat on the grass in a fenced off area within the gig site. On chatting to a few people, I was in the same boat as nearly everyone, no one had done any bar work, and never worked at a gig. We had a briefing about what was on offer in terms of drinks, thankfully everything was in bottles no need to worry about pouring a good pint, and the prices were fairly straight forward most things in whole pounds or 50ps (£4 /£4.50 etc) We were expected to ID people for those looking under 21, and also refuse to serve anyone who was too ratted. I had a brill time, it wasn’t too manic, I had images of people 10 deep at the bar, getting annoyed that you didn’t remember who was next, but with the queuing system they had it was super easy, just called someone over and served them.We didn’t so much have tills, but cutlery sorters (the thing you have in your kitchen drawer to sort cutlery) with £1, 50p and other silver coins, and £5 notes. Underneath this were black bins, when you received a £10 or a £20, you threw the note into the bin and got the change from the cutlery sorter. There were actual bins of moneys, full of £10 and £20 notes which every 15 minutes one of the managers collected up from each bin. Bonkers amount of cash coming through. There were one or two aresy people but general everyone was lovely and enjoyed a bit of banter. I even got to watch a bit of the gig towards the end when everything had calmed down. A great few hours, just a shame there’s not more events like this in South Wales. Just to be clear the money from this, isn’t for the fund raising, this was work for me… however…. Sunday morning me and Mum loaded up my car and headed to the NCP behind the train station, for the car boot sale. Mum had heard that people will hound you when you first arrive to get the best things, I didn’t think much of it, but the first 15 minutes were pretty intense. We arrived about 8.15am, late by everyone else’s standard but after working at the bar the night before, no way was I getting there for a 6.30am set up. 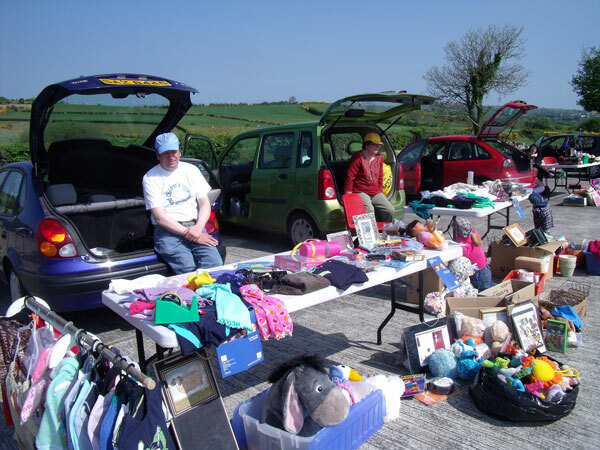 As soon as we started taking things out people were rummaging and nosing through our stuff looking for the best things. I had heard the hawks do this, pressure you so you end up selling something cheaper than you normally would and maybe even try to sell it on their stand the same day. So next time I’m telling people we aren’t selling until were set up. But after that manic phase it was actually not the horrific experience I had pictured in my head, of people offering you 10p for your entire collection of stuff. I was pretty flexibile with pricing, and normally with a bit of hagling and saying its for charity I got the extra 50p or a quid. It was all stuff that Mum wanted to get rid of, as over the years the house has become overrun with stuff, and not willing to just throw it to landfill she would sort stuff, try and get it to charity shops, but after this first one I can see me doing a few more. In 4 hours I managed to raise £150 towards my target, cleared a load of stuff out of the house, and actually enjoyed it. You’re just going on holidays again aint ya? Half way mark that I need to raise £400! Support where you can!